Today I went to ‘Love Bath’ – a free festival organised by the churches of Bath for the community. It was a great chance to get to know people and to meet up with some people who I’d spoken to over the internet (mostly Facebook!). Hats off to Emma Gypps, everyone at Springboard Bath and the whole organisation team! I think everyone especially enjoyed the free hot dogs, bottles of water, hot drinks and ice cream! It was interesting seeing so many Christians together just having fun and enjoying themselves. I was on bouncy castle duty for the afternoon, which was fun…I definitely got more assertive as time when on! I just thought the name for the festival – Love Bath – was so great. Especially when the reading from the Old Testament this morning was altered so that instead of Zion or Jerusalem we had Bath and Aque Sulis! It was really powerful and got everyone involved. After the festival today I came home and saw the latest video by Jefferson Bethke, whose video ‘Why I hate religion but love Jesus’ I’ve blogged about before. I didn’t watch all of it because it didn’t really grab me at the time, but there was a theme that came through for me from both what I saw of the video and also from the festival today. That theme is, of course, love. How can we put love into practice? I was thinking about how much I’d like to move into Bath city and had a look at house prices. Sob! But why can’t I be satisfied where I am? I could give you lots of reasons but really…I have a roof over my head. What more do I need? Jesus says we don’t even need two shirts – share what you have with others. And yet most of the Christians I meet (and I include myself in this) have comfortable lives with plenty of material possessions. It doesn’t mean they’re all obsessed by their possessions (how could I ever make that judgement?!) but they have them. I have them. So how does this sit with the teachings of Jesus? I’ve heard many people criticise the Vatican for the amount of wealth contained within it and I completely understand where they’re coming from. But are we any better? Where do we draw the line between what is needed and what is excessive? Who gets to make that decision? If we gave away everything we owned today we wouldn’t be able to function very well in the modern world of Great Britain. We couldn’t do our jobs properly if we didn’t have technology to communicate or complete work, for example. So what should we give up? Perhaps our time, like Street Pastors. I’m very precious over time as I’m always busy and desperately try to create some downtime to just relax and read a book or watch TV. Perhaps we should give people the time and support that they need like organisations such as The Samaritans. I try to make myself available to talk to people about what’s happening in their lives as much as possible and think that this is something I’m not too bad at doing. Perhaps our money, as we’re encouraged to do by charities. I try to give away what I can but often worry about money. If we are trying to show love to others, does it come down to these things – time, support and money? Is there more to it? How do we find that balance? And do we need to make sure that we show love to ourselves, too? So many questions! I don’t know the answer but I would love to be better at showing love and living a life of love as we have been asked to do. Perhaps by opening ourselves up to receive our love we let that love flow through us and by surrendering and opening to the love of God, we become instruments for his love. Æthelthryth – what a great name!! Long time no blog…again! Sorry for the absence – I’ve been busily marking exam papers for GCSE students around the country and have been focused on that for a few weeks. So I thought I’d launch back into the blogging with a bit about Æthelthryth. What a great name! 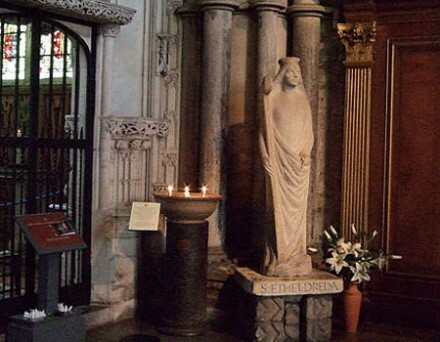 My internet research has taught me that she was one of the widest and most venerated of the Anglo-Saxon saints, which is very intriguing…this blog is an excellent introduction to the miraculous life that she is reputed to have led and I really recommend you give it a quick read. I am interested in the role of women in the church and the argument that surrounds them. I know the reasons why for each side – it’s one thing I teach every year! – but always find it interesting. I suppose it’s one of those things that I’ll never quite understand because I wasn’t brought up going to church…I came to Christianity aged 17, and my relationship with God is based on my experience of God perhaps even more than on learning about the Bible or church traditions. I know about the contradictions in St. Paul and the way that the church has changed and developed over the last 2,000 which has affected the role of women. But here is an example of a woman who is still known today, a woman who lived 1300/1400 years ago. Her story includes other women, and she is remembered alongside kings in several sources.